"To All The Girls I've Loved Before"
The album features Julio's only US Top 40 hits, "To All the Girls I've Loved Before", with Willie Nelson, and "All of You" with Diana Ross. The Beach Boys sang back-up on "The Air That I Breathe", a tune from Albert Hammond's 1972 album It Never Rains in Southern California, which was also a major hit for the British band The Hollies in 1974. ^ "1100 Bel Air Place". Allmusic. Retrieved 28 April 2011. ^ "Quincy Jones moves from 1100 Bel Air Place". Jet. 2005. Archived from the original on 26 August 2007. Retrieved 28 April 2011. 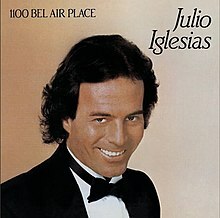 ^ "Canadian album certifications – Julio Iglesias – 1100 Bel Air Place". Music Canada. ^ a b Julio Iglesias 30th Anniversary. Billboard magazine. 2000-05-27. Retrieved 2012-03-10. ^ "Spanish album certifications – Julio Iglesias – 1100 Bel Air Place" (PDF) (in Spanish). Productores de Música de España. Select album under "Chart", enter 1984 in the field "Year". Select the certification week in the field "Semana". Click on "Search Charts". ^ "American album certifications – Julio Iglesias – 1100 Bel Air Place". Recording Industry Association of America. If necessary, click Advanced, then click Format, then select Album, then click SEARCH.